His first girlfriend was named Gertie and he doesn’t want another one. Let that be a lesson, people – protect your right to bare arms! Tattoos fade but dumb is forever. 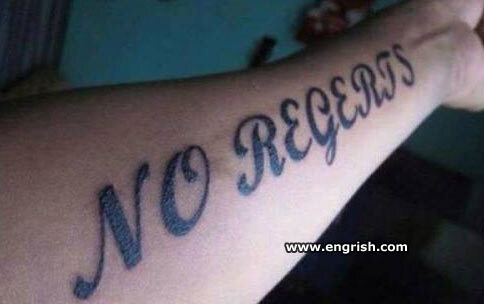 Tattoo parlour policy: No regerts, no redress, no refunds. Golf Pro to blonde: “Now tee the ball”. Non, je ne regerte’ rien…. Isn’t this from a candy bar commercial? Give that tattoo artist my regerts. In this day and age it’s a shame that the Regerts are still discriminated against. They have rights just like everybody else. I don’t know if this counts as I have seen these tattoos in north america. Actually, now that I think about it…could you change that “no” to “eno”? I don’t get it – what did swans ever do to anybody? Can you put “I haert profraeders” on the other arm? Possibly: I think I can manage assumptions? I think I can manage life/existence? I am reminded of a Mr. Boffo cartoon labelled “Waste of a lifetime achievement award”, and it shows a man carving a huge rock sculpture with the words “I’M NOT SPUTID”.